Unfortunately, in the past two years, the Wisconsin Supreme Court has denied review of two significant maintenance cases ordered published by the Court of Appeals. It seems to me that any maintenance guidelines should be established by the courts, which have experience with the issue, have input from both sides and are relatively insulated from the electoral process (how many incumbent judges have opponents?). But you, the members of the Wisconsin Legislature, appear poised to act when the Supreme Court did not accept review in those cases. Thanks. Specifically, you’ve established a “Special Committee on Review of Spousal Maintenance Awards in Divorce Proceedings.” It’s chaired by Rep. Tony Staskunas, D-West Allis, and is considering establishing guidelines for maintenance. While not being invited to be part of the discussion (surely an oversight on your part! ), I thought it only fair to share my thoughts on the topic with you and the committee. I have a few questions. 1. Since the committee consists of three maintenance payors and no recipients, are you really in a good position to recommend guidelines that will affect both sides? Or do you feel this is only a one-sided issue? 2. 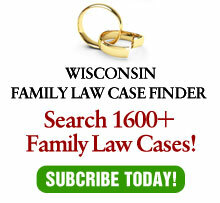 Neither the Family Law Section of the State Bar of Wisconsin nor the Wisconsin Chapter of the American Academy of Matrimonial Lawyers were invited to send a representative. As both of these organizations represent both sides and have substantial experience regarding these issues, why aren’t you interested in hearing from them? 3. One proposal you are kicking around would entail a return to fault. Do you really think that would be wise? One theory of American democracy is that we have 50 laboratories that can learn from each other. Have you consulted any legislators in New York, which just eliminated fault, to ask why? If not, why not? 4. Why is the list of factors set forth in the statutes not sufficiently comprehensive? What additional factors could you possibly add? 5. Other proposals you’re considering would restrict or eliminate the discretion of trial courts under certain circumstances. Given the wide range of variables involved in maintenance decisions, shouldn’t trial courts have wide discretion in applying factors to individual cases? How would you restrain that discretion, and what solace would you give to those victimized by the trial court’s inability to do justice in an individual case? 6. Courts consider hundreds, if not thousands, of maintenance cases annually. Most payors think they pay too much and most recipients think they receive too little. How many of these people do you plan to hear from? Do you really think a few disgruntled litigants should lead to legislation potentially creating unfairness to many more litigants? 7. Have you ever heard of the maxim: “Leave bad enough alone?” Or, do you really think it’s possible to enact legislation that would do justice in every case?